Whilst going through one of the files in the huge collection of Chatham Papers at The National Archives, Kew, I was deliberately looking for references to a ‘Miss E & L Williams.’ Miss Elizabeth and Louisa Jane Williams were under the care of William Pitt from at least 1797, and Elizabeth lived with Pitt until his death in 1806 (Pretyman Tomline Papers Ref. HA 119/4/4/10/5/5). She is listed as a servant in his household at his death, although she was living with him between 1797 and 1801 without being listed as a domestic. 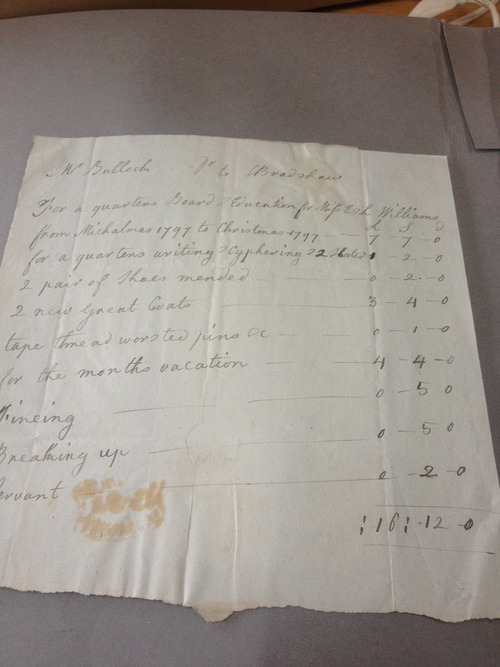 Above is an account (PRO 30/8/213) from Mr. Bullock (Pitt’s manager) to Bradshaw “For a quarters Board & Education for Miss E & L Williams for Michalmas (September) 1797 to Christmas 1797.” This list also includes writing and cyphering, 2 pairs of shoes mended, 2 new Great Coats, tape thread worsted pins, a months vacation, fineing(? ), breaking up, and a servant (??). This is only one such bill for the board and education of the two girls. Ehrman (1996: 93) also refers to other accounts of Pitt paying for or toward the education and upkeep of the girls. It is believed they were the daughters of either William or Edward Williams, both servants of the Pitt family. But why these two girls? Why were they singled out, as it were, to live and effectively be brought up, by Pitt? Pitt was a kind master to all of his servants, and there are records of him procuring jobs and minor positions elsewhere for his former servants. That’s fair enough, and makes sense. But he also didn’t raise their children, as far as the records show. Pitt was a godfather to many children, and one of his wards (Dundas shared responsibility for the boy as well) was Lord Haddo, later Earl of Aberdeen. Nevertheless, there are no existing accounts for Pitt paying for any other person’s education - servant or otherwise - except for Miss Elizabeth and Louisa Williams. So who were they? I’m afraid we’ll probably never know for certain, unless more information that is hidden away is uncovered (which is unlikely, however, as a researcher of social history I always hold out hope!). The UK National Archives. Chatham Papers, PRO 30/8/213. Ehrman, J. (1996) The younger Pitt: The consuming struggle. London: Constable, p. 93. "Lasting admiration and unfeigned regret"
Why was Pitt referred to as "A noonday eclipse"?